On a coastline famous for its rugged beaches and pretty harbours, there’s one remarkable town on the Amalfi Coast that sprawls across a promontory jutting out of the mountains high above the sea. This is Ravello. It’s a view that is hard to forget once you’ve seen it. As I write, I gaze across the valley at the town’s unique setting about 1,200 feet above sea level. 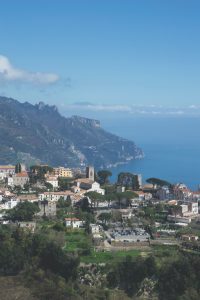 While it’s one of the most visited towns on the Amalfi Coast, along with Amalfi and Positano, there’s always something slightly more tranquil about Ravello. If someone could bottle up its tantalising blend of panoramic Mediterranean views, the sweet scent of flowers from its famous gardens, and charming cobblestones streets, they’d have a hot item. As it is, you must make the journey to discover this place where faith, music and creativity flow. There’s no better way to experience this than on a stroll through town. 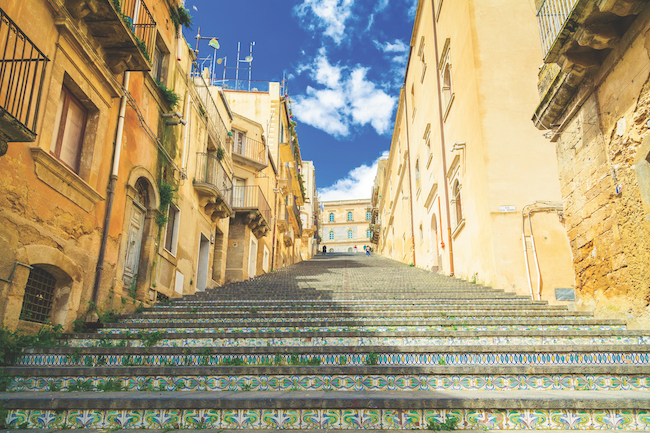 And, unlike most of the rest of the Amalfi Coast, this doesn’t involve quite as many steps. Although there are still plenty! 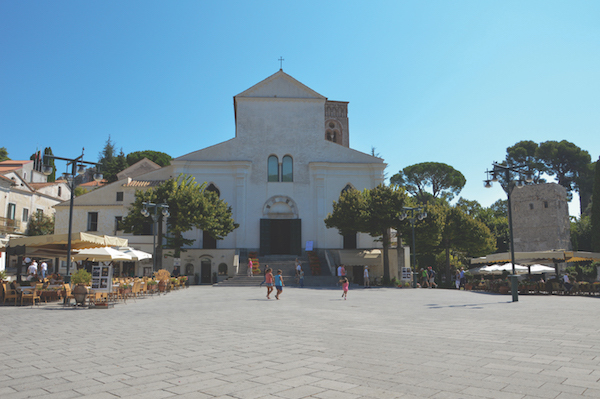 Piazza Duomo (above) sits right in the centre of Ravello and serves as the religious and social heart of town. Everyone passes through this square surrounded by cafés and restaurants – locals, tourists, kids chasing footballs or learning to ride their bikes. The Duomo, with its stark white façade, catches the eye. At the top of a flight of steps, a pair of bronze doors mark the entrance to the Duomo (left). The intricate doors were created in 1179 by Barisano da Trani, whose bronze doors can also be admired on the Cathedral of Trani in Puglia and the Duomo of Monreale in Sicily. 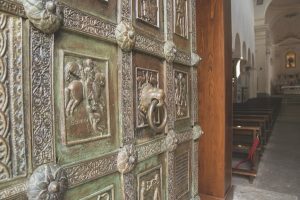 The doors are adorned with 80 bas-relief panels of religious figures and decorative designs, and I think I see something new every time I enter. Down the nave of the church, there are two incredible works of religious art on display. On one side is an ambon, a 12th-century platform once used during services, and on the other a large pulpit from a century later. Both feature elaborate mosaics and narrative scenes. On the ambon, the twisted body of a winged monster swallowing a man is striking. It depicts the Biblical story of Jonah, but instead of a whale, he’s being devoured by what’s called a pistrice in Italian, a mythical sea creature with wings and a long snake-like tail. Now, if that doesn’t strike fear into your heart, nothing will! Just across the aisle are more animals. This time six lions supporting the spiral columns of the pulpit created for Nicola and Sigilgaida Rufolo, who appear in profile on the side. This incredible pulpit is a work of art in every detail, from the expressive faces of the lions to the elaborate mosaic work and the carved eagle statue sitting atop the pulpit. The Rufolo family were the founders of this church in the 11th century, and its location was conveniently right at their doorstep. Just steps from the Duomo and its 12th-century bell tower is another tower. This one marks the grand entrance to the Villa Rufolo (above), once the sprawling home of the Rufolo family. After passing through the suitably impressive entrance tower, a tree-lined pathway leads into the gardens through a cloister with striking black and white interlacing arches that show off the Arabic influences on the medieval architecture in the area. At the peak of the family’s importance in the 13th-century, the villa was said to have more rooms than there are days in the year. While much has been lost over time, the historical character that remains today was largely preserved, thanks to an unlikely source. In the 19th century, Scottish industrialist Francis Nevile Reid bought the villa and spent his life restoring it and reviving its splendid gardens. This legacy is lovingly preserved in the Torre-Museo (right), a museum cleverly built into the soaring Torre Maggiore watchtower. While climbing the tower, videos, photos, and artefacts tell the story of the Rufolo family and Reid’s recovery of the site. 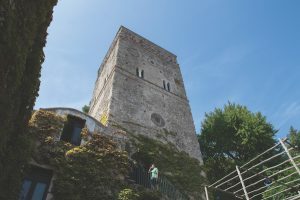 As a bonus for the climb, there’s a stunning viewing platform on the top with a 360-degree panorama of Ravello and a bird’s-eye view of the villa’s gardens. Those gardens are what bring travellers from around the world. During Reid’s time, they were already noted for their enchanting setting with a maze of terraces, floral covered pergolas, and captivating views of the Amalfi coastline. I follow a pathway to a hidden-away overlook with the Church of the Annunziata below and settle onto a bench to savour the view. I can imagine Richard Wagner lost among the gardens, perhaps the air full of the sweet scent of jasmine, and his pleasure at finding the inspiration for the gardens of Klingsor in his opera Parsifal. Many an artist has been inspired by these very gardens, and it’s easy to see why. I know I can never resist pulling out my camera or notebook and getting lost in the views. 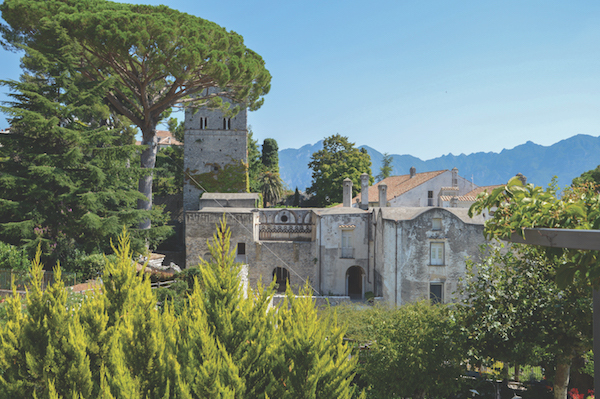 A pleasant stroll through Ravello leads to the very tip of the promontory, which is home to the Villa Cimbrone. This lavish estate contains a 5-star hotel and beautiful gardens that, thankfully, can be visited by the public. Even if you think you’ve seen all the views from Ravello, there are still more to discover. A large wooden doorway opens to the gardens with a view down the aptly named Avenue of Immensity. This walkway is covered with a wisteria-draped pergola (left), and if you can catch it blooming in the spring it’s heavenly. The gardens here were the refuge of another expat, the British banker and politician Ernest William Beckett, Lord Grimthorpe, who bought the property in 1904. While always seeking to retain as far as possible elements of the garden’s historical character, Lord Grimthorpe worked on his connections back home in London to bring in the talents of noted English garden designers and architects like Vita Sackville-West, Gertrude Jekyll, and Edwin Lutyens to add a host of varied elements blending classic English and Italian garden designs into a one-of-a-kind experience. As you stroll down the Avenue of Immensity, pathways lead off to hidden parts of the garden where you can explore grottoes, sculptures and temples. Keep going straight to the end of the long pathway to find one of the Amalfi Coast’s most exquisite views. 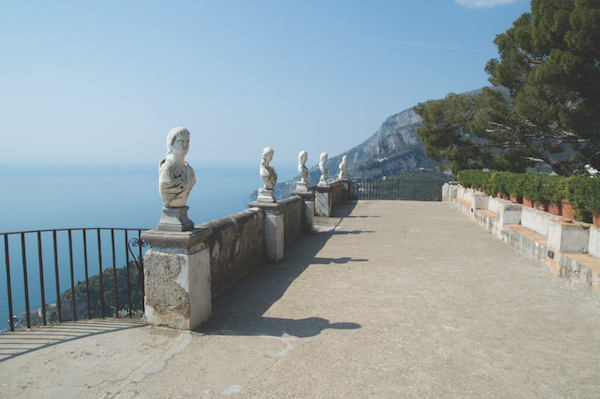 Lined with marble statues, the Terrace of Infinity (above) is a place for dreaming. Peering over the edge at the sheer drop, I can feel a gust of salty breeze from the sea and hear the seagulls calling as they drift by. Meandering back through the gardens I happen across the Temple of Bacchus, where Lord Grimthorpe’s ashes were interred at his bequest. Villa Cimbrone has welcomed many artists and writers over the years, especially during Grimthorpe’s time. Virginia Woolf and members of the Bloomsbury Group sought refuge in these very gardens. When I visit the exotically decorated outdoor tea room and rose garden, I half expect to stumble into a literary discussion taking place or find an artist at work at her easel. Ravello feels like a home to the arts, and it’s a place I return to when I need a moment to re-centre and let its beauty fill me with inspiration. My favourite spot to rest and take in the view while strolling around Ravello is the Belvedere Principessa di Piemonte, a small garden with an oversized view. This shady spot has stellar views down the coastline and, most importantly, benches to sit on and take it all in. The view here seems like a perfectly framed work of art. Listening to the birds chirping away, I think back over the artists who have been inspired here. Painters and photographers trying to capture a moment of beauty in the landscape, poets and writers carried away by creativity, musicians caught up in Ravello’s romantic atmosphere. This is, after all, the place where Wagner found enchantment and where D.H. Lawrence, E.M. Forster and countless other writers found tranquility to write. This artistic tradition is celebrated every summer during the Ravello Festival, an arts and music festival that has brought such acclaim that Ravello is now known as ‘The City of Music’. While it started in the 1950s as a music festival dedicated to Wagner, it has transformed over the years into an arts festival that attracts lots of different and varied international artists. Each season it brings music, opera, theatre, and dance performances to a specially constructed stage in Villa Rufolo. The outdoor setting is beyond beautiful with the Amalfi Coast’s lights twinkling after dark along the coastline. For classical music enthusiasts, the Ravello Concert Society hosts concerts throughout much of the year in historic locations around Ravello. Whether it’s the music, the alluring views, the gardens, or just the opportunity to stroll through the charming streets in this romantic town halfway between the sky and the sea, Ravello’s beauty has a magnetism to it that makes it no surprise that it has inspired travellers from around the world. You never know, it may just inspire you, too. Naples, to the north, is the nearest international airport. From here there are direct flights to Belfast, Birmingham, Bristol, Dublin, Edinburgh, Leeds, Liverpool, London, Manchester and Nottingham. Salerno is the closest you can get to Ravello by train. From here there are connections to Naples and Rome. 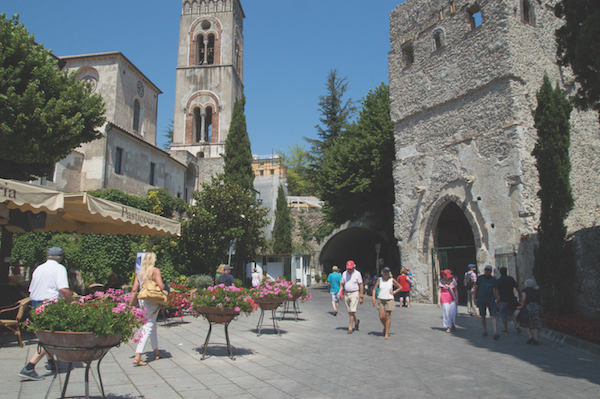 Ravello can be approached via Sorrento or Salerno, but the roads can be busy. 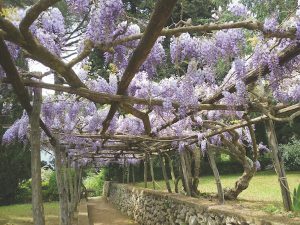 If you’re thinking of a trip to the Amalfi Coast, don’t miss Laura’s Ravello Travel Guide.